I started with a large, plain clay garden pot. I painted it lime green for a splash of color. I chose my plants the same way one would pick out plants for a landscape, making sure they had very similar growing conditions — wet, dry, sun, shade, flowering season, etc. The key is to get small plants, either liners or 4-inch pots, so they can all grow together. My next mission was finding appropriate soil (most box stores carry potting soils with fertilizers, moisture control, and even insecticides). It was a little difficult doing this from the typical home gardener side, but I located fertilizer- and pesticide-free organic potting soil that fit my needs. Once I had all the components and the garden pot was painted, I was ready to plant. After planting, I watered everyday for the first week, then every other day, and eventually only watered when needed. 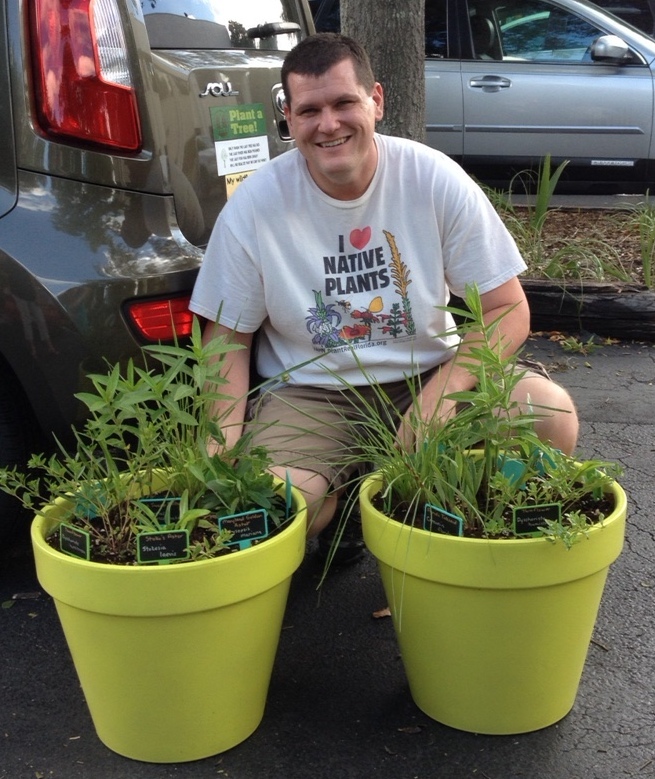 Chris delivers his pollinator pots to FWF staff.